One of the greatest honors of being a Realtor is being the eyes for Steamboat Real Estate for my clients. I know that I am not just looking for real estate for them, I am also looking for the special home for their pets as well. Steamboat is a Pet Lover’s mecca, rarely can you find a community where not only are you known on a first name basis, so is your pet. Within the Steamboat community, each and every pet in the valley is considered a resident as well. We love to see them hiking, swimming, fishing and at the Farmer’s Market with their family. We grieve as a community with our friends and neighbors when a beloved pet passes away. 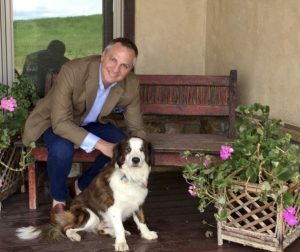 As a community, we realize our pets are the providers of unconditional love and contribute to what makes living in Steamboat so special and desirable. Recently we lost our dear Border Collie, Lincoln to cancer and the Steamboat Springs community grieved his loss with us. I took the position “never again, it’s too hard to say goodbye”. Recently my daughter was online and on the Mountain Pet Rescue website (mountainpetrescue.org ) and found Buddy. After a weekend of hesitation I relented. Before we could call Buddy a member of our family a background check, interviews with our veterinarian and others were done. Then we found ourselves waiting and wondering. On a Tuesday evening we received the call to come get our boy Buddy. The instant I saw him my heart melted and I realized he was rescuing me from the void of not being loved in a way only a pet can provide. As typical with many rescue dogs, time is required to earn their trust, and through time we gain the gift of learning patience. Through learning patience and gaining trust, a pet from a rescue provides a subtle reminder to do everything and treat all creatures with kindness. Now that the word has spread amongst our friends within the Steamboat Springs community that we have adopted Buddy, (actually vice versa) friends and neighbors are excited to be introduced and start their friendship with him. Early into the “rest of Buddy’s life” we are experiencing the joy that comes from adopting a rescue dog. I cannot say thank you enough to Mountain Pet Rescue and all those that initially found Buddy abandoned and scared in Corpus Christi, TX that began the process by caring enough to rescue our Buddy and me. Welcome home Buddy, Steamboat Springs is so glad you are part of our community and all of our lives.